In East Asia, Korean ginseng has long been used as a private medicine and nourishing tonic, used for maintaining physical strength as well as treating and preventing various diseases. Coffee is known for preventing lifestyle diseases such as high blood pressure, myocardial infarction, diabetes and dementia, and has adjuvant effects. In India, Semecarpus anacardium L. f has been used as a cure for private medicine and has been used as various disease treatments. In fact, Semecarpus anacardium L. f. contains bioactive ingredients such as antioxidant compounds. Mexican peppers with bright variegated colors are rich in plant pigmentation. 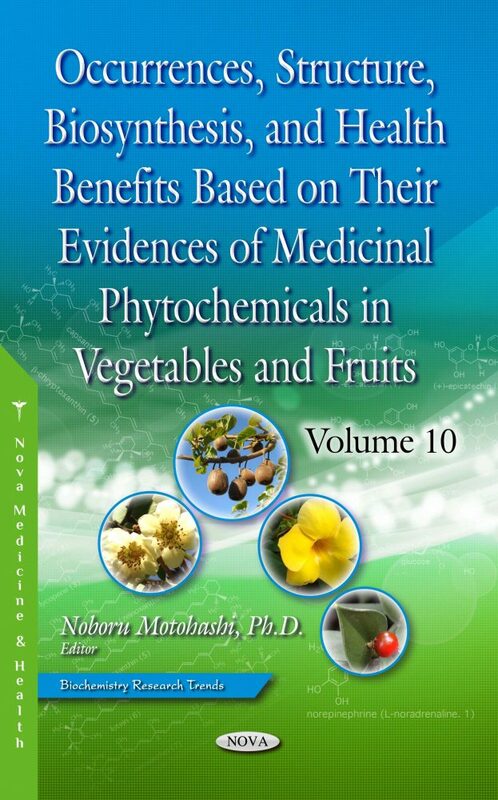 Volume 10 mainly dscribes the effects, preventions and treatments of ginseng, including its folklore remedy as phytochemicals as follows: Chapter One: “Medicinal Phytochemicals and Health Effects of Panax ginseng (Korean Ginseng)”; Chapter Two: “Coffee´s Phytochemicals: From Biosynthesis to Health Benefits”; Chapter Three: “Nature-Inspired Phytochemicals and the Pharmacological Activities of Herbal Plants of the Anacardiaceae Family and Semecarpus anacardium L.f”; and Chapter Four: “Carotenoids from Mexican Peppers and Their Benefical Effects.” These chapters will provide more advanced information to researches in the region of new drug designs for phytochemicals. Chapter 3. Nature-Inspired Phytochemicals and the Pharmacological Activities of Herbal Plants of the Anacardiaceae Family and Semecarpus anacardium L.f.